We are excited to announce the official launch of the "INSPIRATIONS" app by Bhakti Marga (see link at bottom of blog for download). The INSPIRATIONS app sends an individual selected quote each day to your mobile device to inspire your life and spiritual path. 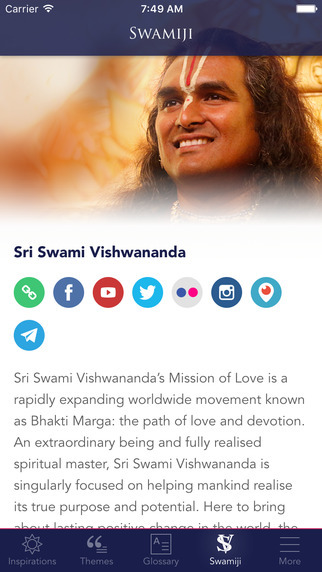 With over 400 selected quotes from the teachings of Sri Swami Vishwananda, this app not only serves as an 'Inspiration' for you every day, but it is also a resource of Swamiji's Divine wisdom. By searching through the many transcriptions of Swamiji's commentaries and satsangs, a conscious selection of these quotes has been made to provide the perfect insights for different aspects of spirituality and day-to-day living. The tech team has served behind-the-scenes to design the app to be both resourceful and simple; and more updates are on the way! Each individual quote you receive is your "Inspiration" for the day that you can read and reflect upon. The quotes can also be easily shared with friends and family on various social media platforms.To supplement the quotes, we have also organised the quotes by "themes" and included a practical glossary. The concept behind the 'themes' section is that the app isn't only for someone to receive a quote each day, but rather, we wanted the app to have multi-functionality. 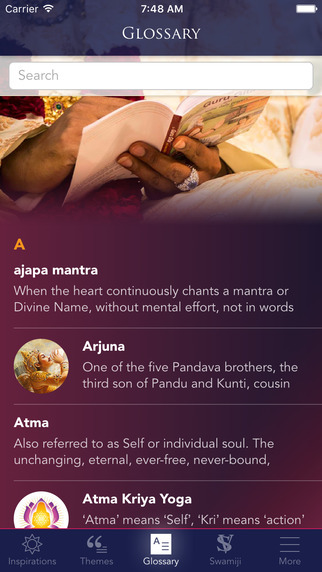 Now, when someone wants to find a quote from Swamiji about a certain topic, they can go onto the 'themes' section of the app and find a quote pertaining to the subject desired. 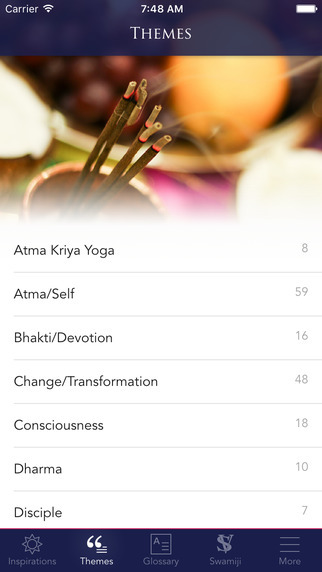 Just to give you a bit more of an idea, some of the topics include, "purification," "surrender," "happiness/joy", "karma", "meditation", and "Yoga." 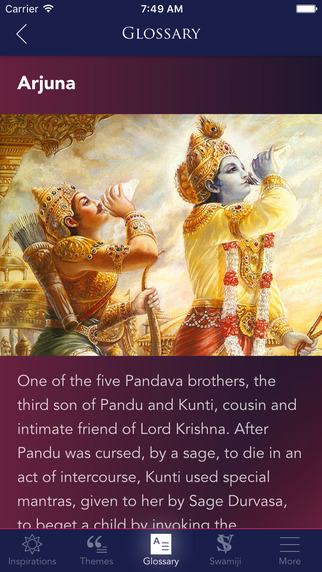 The glossary is another feature that makes sure each and every quote is given its proper context. Oftentimes it can be difficult to find a distinct definition for Sanskrit words and other terms in Hinduism. The glossary is a tool that one can use for both the app and Hindu words in general.